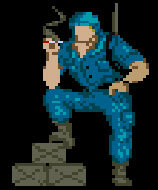 None The hero of Commando, this elusive agent is so top secret, not even the President is aware of his mission. Ordered by a mysterious military agency to infiltrate an unknown, jungle/desert country, the Commando is an expert in military science. Using the U.S. Army Lab Prototype "Unlimited Bullet" Machinegun, and a couple of grenades, this military expert must reach the enemy's base and destroy it from the inside. To get there, he must maneuver through enemy territory. Are you Commando enough? 200 The workhorses of the enemy army. They carry machine guns and sometimes a few grenades with them. They move around quickly, and can shoot at you suddenly. Don't underestimate them, or you'll find yourself six feet under. 4,000 second guard This unfortunate commando agent has been captured by the enemy from a previous mission. He is being led to his military execution for war crimes. Save him before he is led away. The first guard is worth 1,000 points. The second guard is worth 4,000 points. None These soldiers usually ride their motorcycles along higher ledges to drop grenades at you below. Sometimes, they will cruise the deserts trying to run you over. Watch out for them. 500 These soldiers operate the mortar guns in the battlefield. They will let loose barrages of these mortars, and won't stop until killed. Don't stand in one place or you will surely be blown to bits. When you rush them, the mortar soldiers will abandon the mortar gun and pick up their normal machine gun for protection. 500 These soldiers initially use the cover of rocks to protect them from machine gun fire (although you can lob grenades over the rock). When you rush them, they will retreat, fighting like regular soldiers. 500 Barricade soldier are like rock soldiers. They will protect themselves with sandbags, but can die from a tossed grenade. If you rush the barricade, the soldiers will retreat and fire will running. 1,400 These jeeps sometimes appear rushing past you from your sides, while the gunner in the back takes lots of shots at you with a heavy machine gun. They're too fast to throw a grenade, but luckily, machine gun fire will hurt the jeeps. Shoot at them, and avoid the gunner. ???? These jeeps only appear from side to side, trying to run over you. Bullets don't affect them, and they pass so fast (and often behind you) that I've never tried a grenade. Keep away from them is my advice. 200 These soldiers protect enemy lines by waiting in ditches in the earth. They occasionally raise themselves up and take aim at you. They cannot be killed with machine gun fire, but you can lob grenades into the ditch and kill them. 500 These soldiers carry bazookas. The missiles they fire can kill you in mid-flight or where they explode. They move from side to side, or up and down, taking aim at your general location. Shoot them with your gun or grenades. None These heavily armored emplacements shoot explosive shells at you. You can destroy these turrets with two well-placed grenades. 2,000 These guys are not much of commanding officers! At the end of a battlefield, there is a gate that leads to the next battlefield. The commanding officers order all soldiers nearby the gate to attack the Commando until death, while he makes a run for his life. The officers have no weapons and they don't seem preoccupied with attacking, but escaping. Hit him and you get 2,000 extra points.